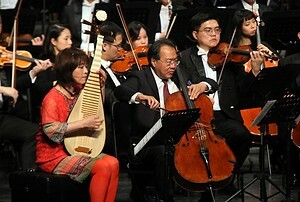 Wu Man and Yo-Yo Ma in second performance of Zhao Lin’s A Happy Excursion with the Hangzhou Philharmonic Orchestra, October 2018. NEW YORK, NEW YORK (February 7, 2019) — Next month in New York, pipa virtuoso Wu Man appears in cross-cultural performances that pair her ancient Chinese instrument with the New York Philharmonic, as well as with instruments from the Middle East to Japan. Through these collaborations, spearheaded by Wu Man, she brings together a variety of fellow artists from the Silkroad Ensemble, including founder Yo-Yo Ma, with whom she has performed as a founding member of the ensemble since its creation 20 years ago. On Friday, March 1 at 7:00 p.m., Wu Man celebrates the reopening of The Metropolitan Museum of Art’s André Mertens Galleries for Musical Instruments by curating a special program featuring fellow Silkroad artists as part of the Museum’s MetLiveArts performance series. The following week, she and cellist Yo-Yo Ma perform with the New York Philharmonic under Long Yu at David Geffen Hall, where they give the U.S. premiere of composer / Silkroad artist Zhao Lin’s double concerto A Happy Excursion on Wednesday, March 6 at 7:30 p.m.; Thursday, March 7 at 7:30 p.m.; Friday, March 8 at 8:00 p.m.; and Saturday, March 9 at 8:00 p.m. The orchestra program also includes Musorgsky’s Prelude to Khovanshchina, as orchestrated by Rimsky-Korsakov, and Tchaikovsky’s Symphony No. 6, Pathétique. Tickets for March 1 start at $50 and are available online at metmuseum.org/tickets or by phone at 212-570-3949. Tickets are $1 for children ages 6 to 16 with the purchase of one adult ticket. For groups of 15 or more, call 212-570-3750. Tickets include same-day Museum admission. Tickets for March 6–9 start at $66 and are available via nyphil.org, the David Geffen Hall box office, or by calling (212) 875-5656. Specially curated by Wu Man, the program at The Metropolitan Museum of Art’s Grace Rainey Rogers Auditorium celebrates the upcoming final phase in the grand reopening of the Museum’s newly renovated and reinterpreted André Mertens Galleries for Musical Instruments. The renovation process was divided into three phases, and the first two phases culminated in partial reopenings in July 2017 and March 2018, respectively. On this program, Wu Man emphasizes musical connections across cultures by bringing together diverse artists from the Silkroad Ensemble, namely bassist Shawn Conley, oud player Hadi Eldebek, sheng player Hu Jianbing, percussionist Yousif Sheronick, and traditional Japanese drummer and flutist Kaoru Watanabe. At David Geffen Hall, Wu Man collaborates with Yo-Yo Ma and the New York Philharmonic to bridge East and West—pairing pipa with cello and orchestra in a Western-style, three-movement concerto by Chinese composer Zhao Lin. Wu Man initiated the co-commissioning of the work, titled A Happy Excursion, by the New York Philharmonic, Beijing Music Festival, and Hangzhou Philharmonic Orchestra (HPO), and she gave the world-premiere performances with Yo-Yo Ma and the HPO at the Hangzhou Grand Theater and Beijing Music Festival in October 2018. Additionally, on Silkroad’s spring 2019 tour, Wu Man performs in the world premiere of Silkroad’s new project Heroes Take their Stands, a five-part, evening-length work that includes a piece from Zhao Lin. Heroes was commissioned by Silkroad in honor of its founding board, in partnership with UCSB Arts & Lectures, Cal Performances, UC Berkeley, Philharmonic Society of Orange County, and the John F. Kennedy Center for the Performing Arts. Performances take place in April and May. In 2017, Wu Man and the Shanghai Quartet premiered Zhao Lin’s Red Lantern, based on a film score by his father, the eminent Chinese film composer Zhao Jiping, who had also composed for Wu Man (Pipa Concerto No. 2). Wu Man has collaborated with Yo-Yo Ma on numerous occasions in the past two decades, including in 2003, when they appeared as soloists (along with Emanuel Ax and Wu Tong) in the world premiere of Bright Sheng’s The Song and Dance of Tears, also commissioned by the New York Philharmonic. Recognized as the world’s premier pipa virtuoso and leading ambassador of Chinese music, Wu Man is a soloist, educator and composer who gives her lute-like instrument a new role in both traditional and contemporary music. She has premiered hundreds of new works for the pipa, while spearheading multimedia projects to both preserve and create awareness of China’s ancient musical traditions. She has performed in recital and as a soloist with major orchestras around the world, and is a frequent collaborator with the Kronos and Shanghai Quartets, The Knights, and the Silkroad Ensemble. 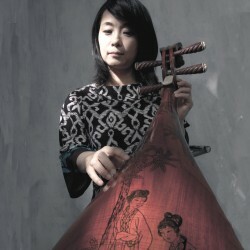 Wu Man has recorded more than 40 albums, including the Grammy Award-winning Sing Me Home with the Silkroad Ensemble that features her composition Green (Vincent's Tune). She was named Musical America’s 2013 Instrumentalist of the Year, but the best measure of her achievement is that her instrument, which dates back 2000 years, is no longer an exotic curiosity. For more information, visit wumanpipa.org. Yo-Yo Ma’s multi-faceted career is testament to his enduring belief in culture’s power to generate trust and understanding. Whether performing new or familiar works from the cello repertoire, collaborating with communities and institutions to explore culture’s role in society, or engaging unexpected musical forms, he strives to foster connections that stimulate the imagination and reinforce our humanity. In August 2018, he began a new journey, setting out to perform Johann Sebastian Bach’s six suites for solo cello in one sitting in 36 locations around the world, iconic venues that encompass our cultural heritage, our current creativity, and the challenges of peace and understanding that will shape our future. Each concert will be an example of culture’s power to create moments of shared understanding, as well as an invitation to a larger conversation about culture, society, and the themes that connect us all. For more information, visit yo-yoma.com.